Can you add the stop condition selection? I need it to stop a skill use condition created as needed. thanks for adding the “Start bot” action! i assumed, that i can add multiple then-actions. that means, 1 then-action per N if-conditions. is there any way to change/improve that? if not, could you maybe add the negatives of “Botting” and “Botting time (minutes)”? to restart the loop i am trying to get. sorry ryan! my bad. i havent recognized, that i am able to multi-select inside of the then-box. ignore everything i wrote in this post before. adding multiple then-actions works very well. unfortunately the bot wont start anyway after it got stopped by a condition. the following condition not work properly. even with that Wait it just stops the bot, but doesnt start it afterwards at all. got it. it’s related to the Botting condition. 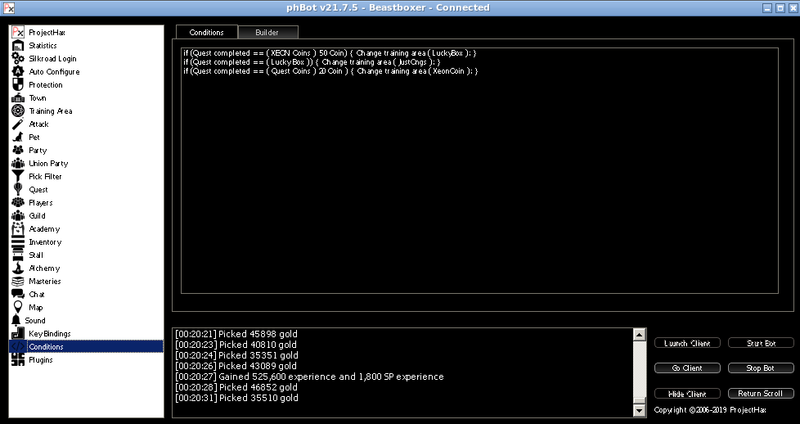 without that Botting condition it stops and starts the bot again, even when it got already stopped manually. that means, this Botting time (minutes) condition triggers all the time. it doesn’t matter if its botting or not. “Botting Time” at the statistics tab is always “0 minutes” when the bot is stopped. its really curious that this condition gets triggered then. You can’t restart the bot since the condition check function is called when botting. If you are not botting then it’s handled in another thread. This is to prevent disconnects when casting skills if the bot is enabled. If it were to only handle conditions outside of botting/tracing it could be trying to cast multiple skills at the same time. the only issue here is, that this condition even triggers when the bot is stopped - right after 1 minute. There’s not really a way to do it. Why do you need to restart the bot? this works! i am doing it this way right now i need it to restart my stall-loop. bot is at its stall position in town. works very well now. i’m almost happy. the only issue which is left: the condition even triggers when i stopped the bot although it just checks if the botting time is >= 60 and this cannot be true when the bot is stopped. Botting time > 60m -> stop bot. Time elapsed > 1 -> start bot. It shouldn’t start the bot if it’s already started. That could restart it if you needed a different way. what should i expect from this ? If time elapsed is exactly 1 second it will send a general chat message. Probably useless. So when this “Time” starts and elapses exactly ? +How can i send chat message every second ? You should use greater than. It’s unset when you first login so it will trigger immediately like I said earlier. After the condition triggers then it will be set to the current time. @Ryan Why doesn’t the training area change without returning to town? but he does not see the new field of education before he returns to the town, and he does not go there. It’s just not updating in the UI. It is in the bot though. but then he does not go to the new field of education, he has to go back to the town, is it possible to go to the new education area without going back to town? Nope. I could maybe add path finding for that.